GOUDA, The Netherlands, March 21, 2012 – Noise control engineers from ABC International Trade B.V., in concert with engineers at the University of Antwerp, Belgium, and Akoestische Bouw Constructies BV., have incorporated Acoustiblok® noise abatement material into the design of the OtoCube®, the first and only fully equipped desktop audio booth for testing and calibrating the cochlear implants of deaf individuals. A cochlear implant (CI) is a surgically implanted electronic device that provides a sense of sound to people who are profoundly deaf or severely hard of hearing. Audiologists currently use test rooms or screening booths that measure between five feet and six feet tall to measure and calibrate CI devices to suit each individual patient’s level of deafness, sensitivity, and CI performance. By simply connecting the OtoCube via a computer USB port, it is ready to perform all audio logical tests available through its large-scale, non-portable predecessors. In order to meet the standards for blocking ambient noise that would make this portable unit as effective as the large booths, engineers at the University of Antwerp and ABC B.V. applied a 3mm layer of Acoustiblok noise blocking material within the unit, creating a sound insulation layer without adding weight or taking up too much space within the small box. Development of the OtoCube was based on an idea from Paul J. Govaerts, MD of the Eargroup in Antwerp, and with a grant (European subvention) from Belgium-based Otoconsult (7FP-SME-2266 Opti-Fox) to improve the standards of CI-fitting. “This is a very small audio logical box into which the receiver portion of the CI is placed and then connected to the deaf patient,” said Haico van Oosten, a Research and Development Engineer in the University of Antwerp’s Biomedical Physics department. “To perform the testing, it must be quiet in this box, but finding the right material for the sound insulation portion of the design was a difficult task. The OtoCube weighs less than 15 kg (33 pounds), according to Ad Vreeswijk, ABC International Trading B.V.’s General Manager Europe. The sound insulation qualities of the Acoustiblok, Vreeswijk says, help the OtoCube set a new standard in precision, usability, and sound insulation for ambient noise. Programming a cochlear implant is a technical intervention, which is done only by a trained audiologist. Achieving the best possible programming of the bio-electrical device is the audiologist’s primary goal when testing and calibrating each individual’s cochlear implant. The OtoCube provides a portable device that can reach many patients when access to a testing booth is impractical or impossible. The OtoCube prototype, currently being clinically tested in several European clinics, is expected to be marketed by 2013. There are approximately 240,000 cochlear implant recipients worldwide, including 41,500 adults and more than 30,000 children in the U.S. Only one in approximately 130 people around the world who could benefit from a cochlear implant has received one. However, since 2004, U.S. health policies have been put in place to increase CI recipients by 10 percent. ABC International Trade B.V. is a sound designer and manufacturer of sound-insulating and soundproofing products for industrial and civil construction, and Acoustiblok’s distributor in The Netherlands. ABC manufactures products in Asia, and is a dealer-supplier in Scandinavia and throughout Europe. The company’s most recent self-developed products include noise decoupled wall ties and backstage noise barrier systems for theaters. Established in 1996, ABC Sound is a partner of ABC International Trading B.V. and Acoustical Partners B.V., offering high quality soundproofing and sound absorbing products throughout Europe and Asia. For more information, visit the ABC International Trade B.V. website. Acoustiblok, Inc., a NASA spin-off company, has been providing high quality noise abatement products since 1998, earning the industry’s highest ratings from architects, builders, and consumers. Acoustiblok is a proprietary viscoelastic polymer material with a high density mineral content, heavy and yet extremely flexible. As sound waves cause the Acoustiblok material to flex, internal friction occurs and the acoustical energy is transformed into immeasurable trace amounts of heat (adiabatic). Just one, 1/8 inch layer of Acoustiblok in a standard wall will result in more sound reduction than 12-inches of poured concrete. Environmentally friendly, Acoustiblok contains no lead, barium, or asbestos, is UV resistant and impervious to water and mold; it is UL rated and classified in the US and Canada (CUL) for virtually all wall, floor, and ceiling installations. For more information, visit the Acoustiblok website, Email sales@acoustiblok.com, or call 813.980.1400. 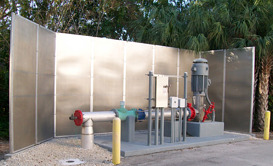 MANALAPAN, Florida, March 1, 2012 – Installation of Acoustiblok® “Hurricane” All Weather Sound Panels at a water treatment plant in the Manalapan-Hypoluxo island community of West Palm Beach is complete, ending an almost year-long battle to quiet noise that was bleeding from the plant into residential areas of the tiny island community. In March, 2011 residents of the secluded community, tucked between the Atlantic Ocean and the Intracoastal Waterway in Palm Beach County, began complaining about noise from the island’s water treatment plant that was disrupting their tranquil setting. Town officials at first requested the plant be enclosed, but later deemed enclosure impractical and requested other options that would allow the sound insulating structure to be moved or removed, and would also allow easy access to the plant equipment for maintenance and repairs. They eventually turned to Kurt King, an engineer with West Construction in nearby Lake Worth, to find a solution. King, an expert in creating noise barrier solutions for water treatment plants and other facilities with loud pumps, blowers, compressors, exhausts and industrial machinery, chose to install Acoustiblok’s Hurricane All Weather Sound Panels at the Manalapan Water Treatment facility. Lahnie Johnson, founder and president of Acoustiblok, Inc., said the Hurricane model of the company’s All Weather Sound Panel was specifically designed for settings like this one on the Manalapan-Hypoluxo island. “The decision to use Acoustiblok All Weather Hurricane Panels to reduce the industrial noise from this water treatment plant was a win-win for everyone,” Johnson said. “Whenever you have high maintenance equipment like this, you need sound barriers that allow for easy access to it, and you need a solution that can withstand the high winds, humidity, salt air, dirt, dust, sand and other elements that are unavoidable in an oceanfront environment. “Extreme dust conditions can disable conventional sound absorbing systems, while these panels are engineered to perform as well in the worst conditions as they do under calm conditions; and since they both block noise and absorb it, you could not have found a more all-inclusive solution to this community’s noise problem,” Johnson said. Acoustiblok, a NASA “Spin-off” company, developed the Hurricane All Weather Sound Panels, engineered specifically to withstand the most rigorous outdoor and industrial environments. Water, moisture, humid salt air or salt water, dirt, dust, UV, chlorine air, corrosion, and most harsh chemicals do not affect them. 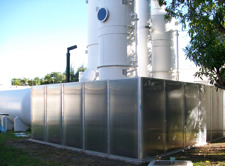 The industrial Hurricane panels are available with an acoustically transparent five milron stainless steel dust filter for outdoor use in the world’s toughest environments, from the mining industry to the desert areas of the Middle East, and other applications where dust is a concern. Acoustiblok sound panels are extremely durable and are currently in use by the United States Army in the Middle East. Washable, durable, long lasting and usable in hundreds of areas and applications, the Acoustiblok “Hurricane” All Weather Sound Panels are not just "sound absorbing" but also "sound blocking." This allows the panel to not only absorb sound but also stop the sound from penetrating through the panel, a very meaningful advantage over conventional "sound absorbing" panels that stop sound reflections but are poor sound barriers. For more information or to view a video demonstration of Acoustiblok’s sound deadening capabilities, visit the Acoustiblok website, Email sales@acoustiblok.com, or call 813.980.1400.